You have got to love your putter. Not only the way it looks, but also the way it performs. Its feel and weight must be just right for you. It is defined by Dave Tutelman as a combination of a Putter's Feel (Swingweight) and its Performance (Moment of Inertia). Specifically how head-heavy it feels in your hands and how the placement of its mass affects the timing of its release. Weight and Mass are different concepts. The weight of your putter is a measurement of the pull of gravity. In contrast the mass of your putter is the amount of matter it contains and the extent of its inertia - the resistance to being accelerated when acted on by an external force. One that matches the golfer's body for size and strength. One that tugs the forearms down a bit so the elbows stay relaxed. One that does not require any jerkiness to initiate the backstroke. The feel of your putter is personal. It is essentially the feel of your putter's dynamic rather than its static weight. It is influenced by a combination of the weight of the putter head, the weight of the grip, the length of the shaft, and the overall balance point of your putter. The tendency in putter manufacture is to make putter heads heavier. The greater overall mass and its distribution within the head reduces the length of the backstroke needed to send your golf ball a certain distance as well as minimising the twisting of the putterface at impact. This all helps with both distance and directional control. The head-heaviness of your putter is also influenced by the length of your putter and the type of grip that is fitted. Shorten the shaft by a few inches to accommodate your size and you should theoretically increase the weight in the head. Similarly fit a bigger and heavier grip and your putter head will feel lighter. Now it is important to realise that a putter that may feel right to one person may feel wrong to another. There is no one correct swingweight – how the putter's total static weight is distributed throughout its length. If you balance your putter on your finger you will find a point where the weight in the head balances the weight at the grip end. This is your putter's balance point. (This is not to be confused with the direction your putterface points when balanced on your finger - skywards, to the ground, or somewhere in between). 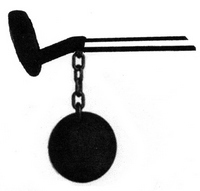 A putter's balance point can be altered by the insertion of a weighting system in the shaft. A product such as the Tour Lock Opti-Vibe with its varying weights gives you the ability to optimize the overall weight and balance point of your putter to best suit your feel and performance preferences. 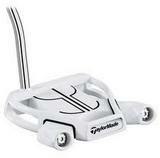 Some putters have adjustable head weights fitted to the sole of the putter. This also allows you to change the balance of the putter. Putter Heft is personal. Only you know what feels good and mostly, after modifying your putter to the correct length, it is a case of experimentation.